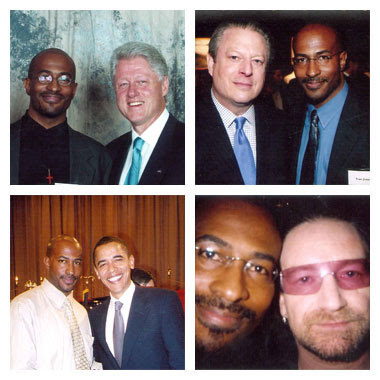 Obama File 72 Obama Appoints "Former" Communist To White House "Green Job"
A few short years ago Anthony (Van) Jones was a Bay Area radical agitator-a committed Marxist-Leninist-Maoist, waging war on the police and capitalist system. Today Van Jones holds a key position in the US government and has the ear of President Barack Obama. Jones is the founder of Green For All, an organization focused on creating green jobs in impoverished areas. He is also the co-founder of the Ella Baker Center for Human Rights and Color of Change, and was the author of the 2008 New York Times best-seller, The Green Collar Economy. Today Van Jones mixes not with street level militants, but with the cream of the left "establishment". But who is Van Jones? Has he really abandoned his communist beliefs? Van Jones first moved to San Francisco in the spring of 1992, while studying law at Yale, when the leftist Lawyers Committee for Human Rights hired several law students to act as legal observers during the trial of policemen charged with assaulting Rodney King. Not guilty verdicts in the King case led to mass rioting-which Jones joined in. Arrested and jailed, Van Jones met a whole new circle of friends. "I met all these young radical people of color - I mean really radical, communists and anarchists. And it was, like, 'This is what I need to be a part of... I spent the next ten years of my life working with a lot of those people I met in jail, trying to be a revolutionary...I was a rowdy nationalist on April 28th, and then the verdicts came down on April 29th..By August, I was a communist." The communist organisation Van jones went on to lead was called Standing Together to Organize a Revolutionary Movement (STORM). Returning to Van Jones, with all the shimmer associated with a rising star, many forget that a man now advising the president was a member of a revolutionary organization in the SF Bay Area called STORM (Standing Together to Organize a Revolutionary Movement). 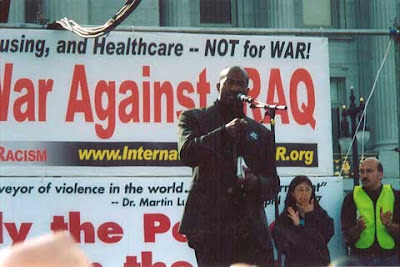 Throughout the group’s history, Van Jones was seen as a public figure within the Bay Area left and a leading member of STORM. STORM had its roots in a grouping of people of color organizing against he Gulf War in the early 1990’s and was formally founded in 1994. The group’s politics had a number of influences, but evolved towards what could be best characterized as third worldist Marxism (and an often vulgar Maoism). The group grew in influence until its disbanding in 2002 amid problems of internal dynamics and especially controversy around the leadership roles that members played in the youth movement (such as the fight against Proposition 21). Nearly the entire membership of the organization was staff members for various social movement non-profits in the Bay Area, many linked to the Ella Baker Center, which Van Jones steered. 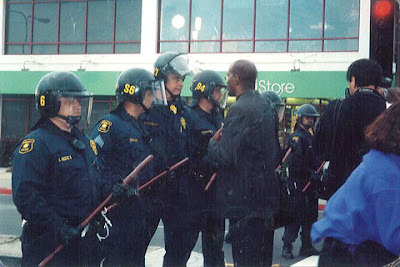 While never large, STORM was one of the most influential and active radical groups in the Bay Area, controlling numerous front organisations including Bay Area Police Watch, one of several anti police activities Jones was involved in. Other STORM fronts included a Marxist training organisation-School of Unity and Liberation (SOUL) and an unemployed rights group-People Organized to Win Employment Rights(POWER). Jones and STORM were also very active in the anti Iraq War demonstrations of the early 2000s. While way out on the left STORM also worked with "mainstream" communists. Bay Area left identity Elizabeth (Betita) Martinez was close to Jones and helped "mentor" his Ella Baker Human Rights Center. 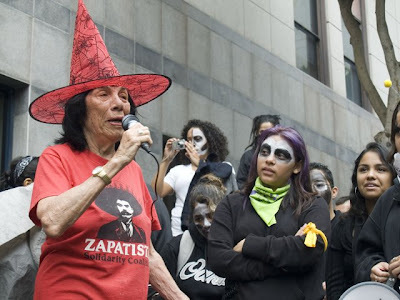 Martinez was a long time Maoist who went on to join the Communist Party USA breakaway organisation Committees of Correspondence for Democracy and Socialism (CCDS)in the early 1990s. Martinez still serves on the CCDS advisory board alongside radicals such as Angela Davis, Timuel Black (a personal friend of Barack Obama who served on his 2004 Senate campaign committee) and musician Pete Seeger (who performed at Obama's Washington Inauguration Concert. Martinez is also a board member of Movement for a Democratic Society, the radical parent body of Progressives for Obama. They also both worked together with another STORM member Adam Gold on the organizing committee for anti Iraq War newspaper War Times. STORM also had ties to the South African Communist Party, with three "core" comrades attending the SACP Congress in 1998. STORM may have learned about Amilcar Cabral from the SACP which also revered him. A tribute to Cabral from the SACP's African Communist, No. 53, second quarter 1973. "How is it that we, a people deprived of everything, living in dire straits, manage to wage our struggle and win successes? Our answer is: this is because Lenin existed, because he fulfilled his duty as a man, a revolutionary and a patriot. Lenin was and continues to be, the greatest champion of the national liberation of the peoples." These were the words addressed to the delegates attending the seminar on "Lenin and National Liberation" held at Alma Ata, capital of Soviet Socialist Republic of Kazakhstan, in 1970 by Amilcar Cabral, Secretary-General of the PAIGC, who met his death on 20th January 1973 at Conakry, Guinea, at the hands of a traitor, Innocenta Canida, an agent of the Portuguese colonialists who had infiltrated into the ranks of the movement three years ago. These words reflect the revolutionary thinking and life-work of this utterly dedicated patriot, outstanding African revolutionary of our time and the father of the new independent sovereign State of Guinea in the process of birth. It was the cognition of the scientific theory of revolution, of Marxism-Leninism, to which he was introduced by his contacts with the Portuguese Communist Party during his student days in Lisbon which was to combine within him, in the words of the statement of the Central Committee of the South African Communist Party, "a deep understanding of the processes of the African revolution with an untiring devotion to practical struggle." Van Jones has named his three year old son Cabral-in honor of his hero. Is Van Jones living up to that quote? Is Van Jones hiding "nothing from the masses of our people"? Off topic but did you see President Hussein bow down before the Saudi King? I was APPALLED!!! Members of the British Empire may not find that outrageous but bowing to royalty is offensive to most Americans. Of course the media has not reported his submission to the Islamic monarch. Just a day before Mrs. Hussein insulted the Queen by putting her hands around her. Americans have a long tradition of not recognizing royal protocol but this was an insult. Either the Hussein's don't have a clue about such matters or they do and that would be even worse. It means they are submitting to Islamic royalty while insulting British royalty. We either have an amateur or a radical with Islamic leanings for a president. Or both! You are an uneducated fool. Regarding Amilcar Cabral, the quote that Van uses is spot on. America is wonderful in concept, terrible in execution. Only when the fat, lazy, Big Gulp drinking racist militiamen are the minority will this country realize its true greatness. Thank God for people like Van and President Obama, and anyone else fighting for the average person. Modern conservatives are a scam; they don't care about the average working person. Only idiots believe anything they have to say. Excellent work again. Thank you. Just read that Van Jones had a nervous breakdown in 2000 which took him two years to recover from. I have compassion for anyone going through that, but it is another reason to question his stability, even if you agreed with his politics. Arthur, I'd like to have a little bit of what you've been smoking. "Thank God for people like Van and President Obama"? Obama is a Communist and hopefully his attempt to destroy America is foiled. Eveyday Americans are coming to realize what he's doing and opposition is growing rapidly. Now he is showing his hand even more by enlisting a Communist that has publicly voiced his loyalties. Keep up the good work. We all need to unite globally to fight the evils of Communism! Congratulations on breaking this story! I see a lot of other people are now trying to take credit, but at least a few of us know the truth.